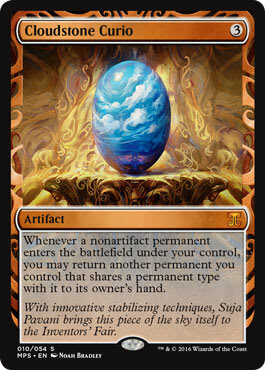 In Standard, Nykthos, Shrine to Nyx has shown how powerful of an effect neo–Gaea's Cradle can be. "Mono-Green Devotion Ramp by Hurrr on MTGO"
There were a few things I didn’t really like about this list. The first thing is that having an accelerant on turn one or two is critical to how the deck functions. Second, past the first Cloudstone Curio, the other Curios are completely dead, so drawing a second Curio is a mulligan. Third, you suffer from the ramp problem of drawing too much mana and not having ways to gas up. Cloudstone Curio with Elvish Visionary addresses this problem, but it requires two cards. Harmonize seemed to be a great way to immediately gas up, and it gives you another card to bring back with Eternal Witness. The original sideboard seemed very focused on certain matchups, but it also seemed also kind of loose—Fracturing Gust is a lot slower than Creeping Corrosion, and Blood Moon isn’t actually good here. 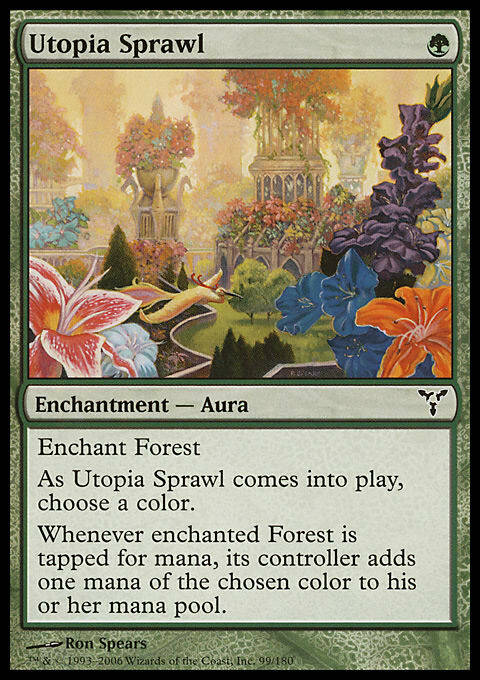 Arbor Elf, Utopia Sprawl, and Fertile Ground are the most important cards in the deck. 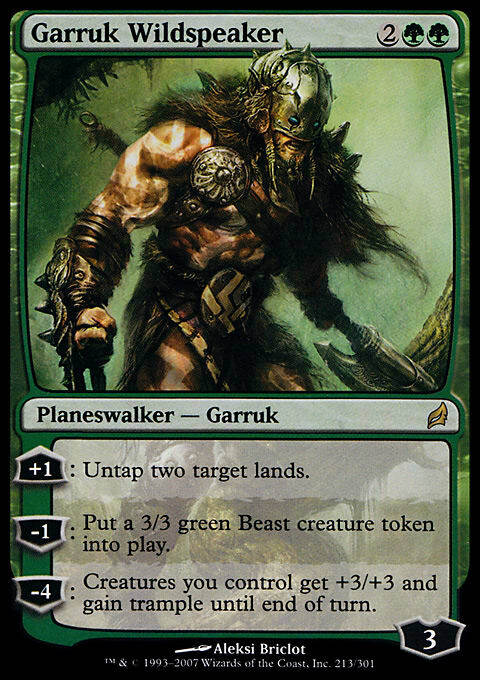 With your best draw, you can play Garruk Wildspeaker on turn two (turn-one Forest, Arbor Elf, turn-two Forest, Utopia Sprawl on the untapped Forest, float , untap it with Arbor Elf, play Garruk Wildspeaker). From there, you can make more mana or make a Beast. Burning-Tree Emissary mostly serves as an enabler for Nykthos that also lets you play another spell on turn two or three. Elvish Visionary gives you velocity and also lets you combo out with Cloudstone Curio. Eternal Witness serves a few roles in this deck. It also contributes two symbols with regard to Nykthos. (In fact, I have played Witness many times without any target in the graveyard just to get things going.) It lets you keep chaining Genesis Waves together, and with Primal Command and other creatures and enough mana, it lets you put all of the opponent’s lands on top of his or her library. Primeval Titan, along with Genesis Wave and Harmonize, are the big gas cards of the deck. You need to draw at least one of these per game to win. The sideboard of ramp decks like these tend to not be great—you don’t want to dilute your deck too much. As a rule of thumb, I don’t think you can take out more than seven or eight cards in any given matchup. Turn two: Burning-Tree Emissary, Burning-Tree Emissary, Burning-Tree Emissary, Burning-Tree Emissary, Nykthos, Genesis Wave for 6 into Eternal Witness, Garruk Wildspeaker, Utopia Sprawl, and three other irrelevant permanents. First, you have to attach Sprawl to a land that’s already in play. You can then use the Witness to bring back Wave, use Garruk Wildspeaker to untap Nykthos and the Forest, and cast another huge Genesis Wave, which probably wins you the game. That is the actual best possible draw, but turn-three or -four wins are not uncommon, assuming your opponent doesn’t have too much disruption. If you are casting Genesis Wave and you reveal Auras, you have to attach them to lands that are already in play. Keep this in mind. That usually means loading up one or two lands with all of the Wild Growth effects is correct (unless playing against Ghost Quarter and the like). Your end game involves Genesis Waving into Cloudstone Curio (unless it is your last card) and putting all of the opponent’s lands on top of his or her library via a loop of Cloudstone Curio and Eternal Witness. Among the most common decks in Modern, I would say that Affinity is probably the hardest matchup since you don’t do anything to disrupt that deck’s setup turns, and Affinity has an equally fast goldfish. 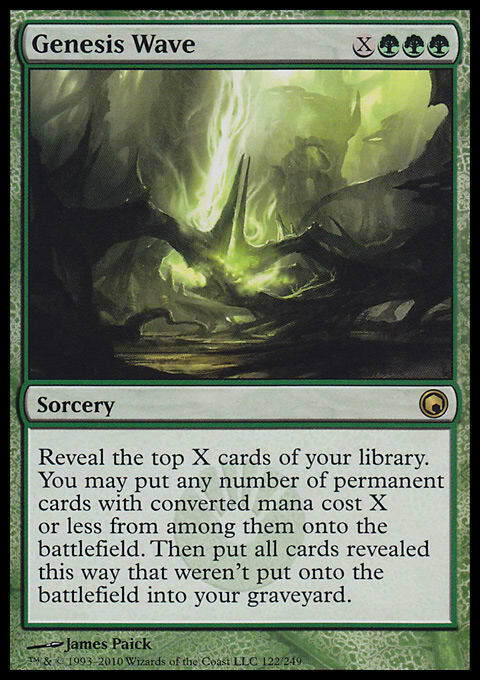 You are very well-equipped to grind Jund out with Garruks, Eternal Witnesses, and Harmonizes, and any big spells—such as Genesis Wave and Primeval Titan—off the top gives Jund a lot of problems. Tron and Melira-/Kiki-Pod decks are pure races, although R/G Tron can certainly be annoying with Oblivion Stones. R/W/U control seems to be a bad matchup on paper, but I’ve found most of that deck’s cards don’t line up well against yours, and if you gain a mana advantage, you can usually resolve a big threat under the opposing Mana Leaks and Spell Pierces. I had a lot of fun testing this deck—a lot of people didn’t have an idea of what was going on, and you get to cast BIG THINGs . . . and seriously, who could say “no” to BIG THINGs? I welcome comments here or on Twitter @jkyu06.